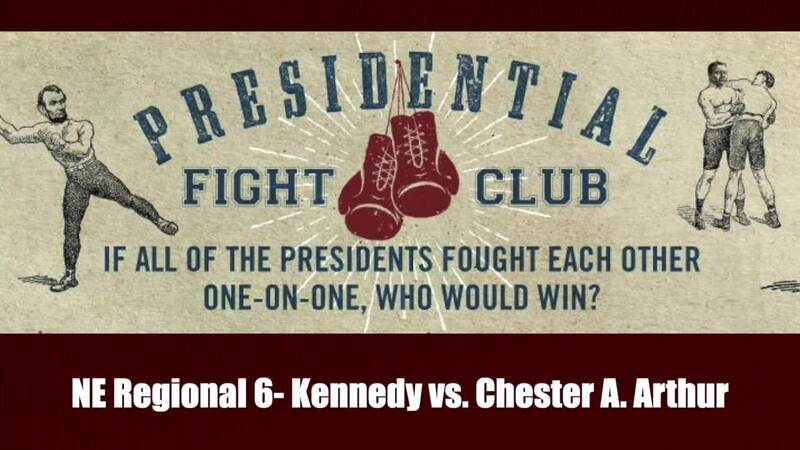 Description: Kennedy vs. Chester A. Arthur. Stats of Fighters: Name: John F. Kennedy Height: 6’0 Weight: 175 Military experience: Lieutenant (navy). Served in combat during World War II. Special abilities: Incredible endurance under extreme pain. Kennedy suffered Addison’s disease his entire life, causing terrible physical suffering in his joints and abdomen. 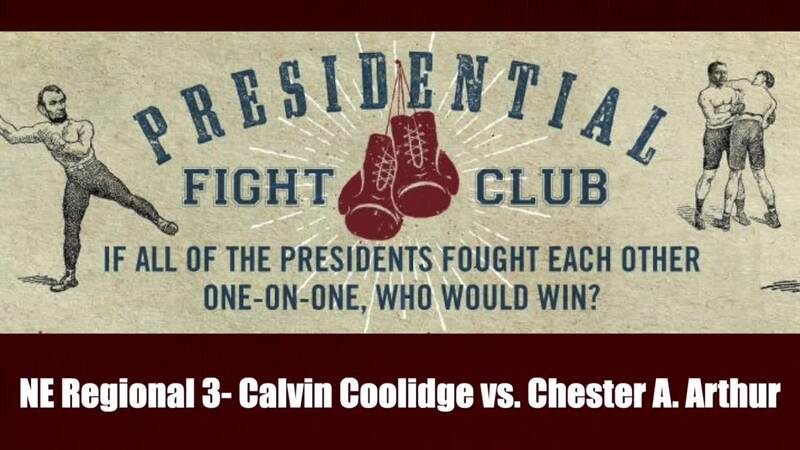 Name: Chester A. Arthur Height: 6’2 Weight: 225 Military experience: Brigadier General. Special abilities: Master manipulator. Description: Teddy Roosevelt vs. John Adams. Stats of Fighters: Name: Theodore Roosevelt Height: 5’10 Weight: 220 Military experience: Colonel, U.S. Army. Special abilities: Being the world’s most interesting man. 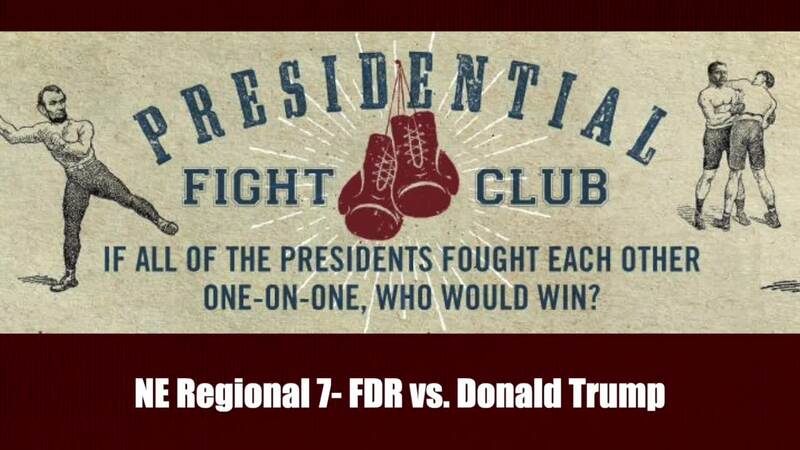 Roosevelt was a champion intramural boxer in college, practiced judo while president, worked as a rancher in the Dakota territories and got in fist-fights with cowboys. Name: John Adams Height: 5’7 1/2 Weight: 175 Military experience: None Special abilities: Supreme self-assurance. 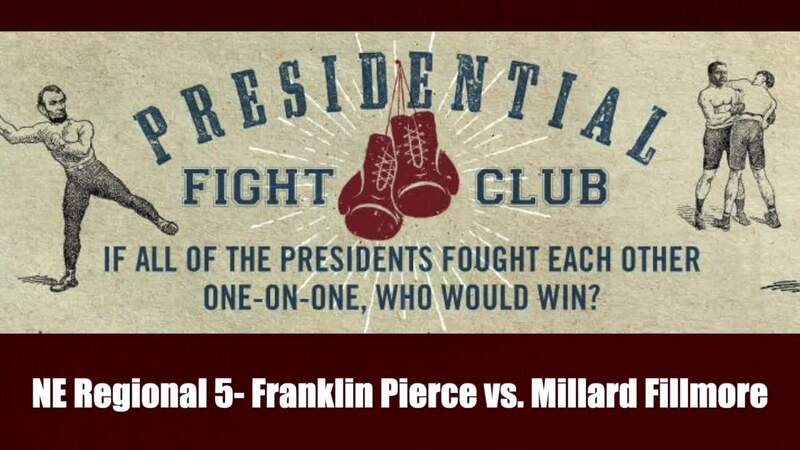 Description: Franklin Pierce vs. Millard Fillmore. Stats of Fighters: Name: Franklin Pierce Height: 5’10 Weight: 145 Military experience: Brigadier General; New Hampshire Militia, 1831–46; Mexican–American War; commanded Infantry Brigade at Battle of Contreras, Battle of Churubusco, and the Assault on Mexico City. Special abilities: Stone-cold ruthlessness. Pierce fought at the end of the Mexican-American War and led a brigade despite being thrown from his horse and injured on the battlefield. He continued to bark orders while completely immobile. While president, Pierce was charged with running over a woman with his horse; the case was thrown out due to a lack of evidence. He was also a chronic alcoholic praised by his opponents as “the victor of many a hard-fought bottle.” Name: Millard Fillmore Height: 5’9 Weight: 165 Military experience: Major, New York State Militia; Served in New York Militia in 1820s and 1830s; Organized Union Continentals home guard unit during the Civil War. Special abilities: The power of invisibility on account of being utterly forgettable. The thirteenth president was chosen as Taylor’s vice president only on account of being a Northeasterner. He failed to quell the oncoming Civil War. In that battle he formed a forty-five-man militia, but the only action they saw was marching in parades. 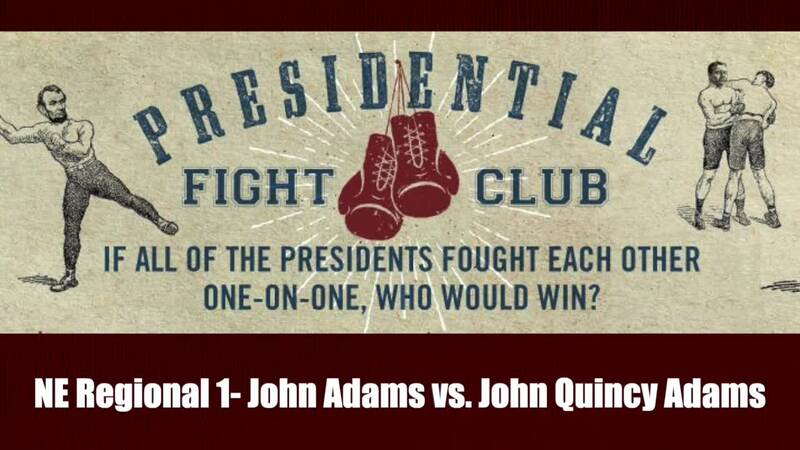 Description: John Adams vs. John Quincy Adams. Stats of Fighters: Name: John Adams Height: 5’7 1/2 Weight: 175 Military experience: None Special abilities: Supreme self-assurance. Name: John Quincy Adams Height: 5’7 1/2 Weight: 175 Military experience: None Special abilities: Extreme versatility. He was the man of the house at age eight when his father left and the Revolutionary War happened right outside his house. Description: Millard Fillmore vs. Martin Van Buren. Stats of Fighters: Name: Millard Fillmore Height: 5’9 Weight: 165 Military experience: Major, New York State Militia; Served in New York Militia in 1820s and 1830s; Organized Union Continentals home guard unit during the Civil War. Name: Martin Van Buren Height: 5’6 Weight: 165 Military experience: None Special abilities: Master manipulator. He was known as the “little magician” or the “red fox” for his ability to control and mastermind elections. 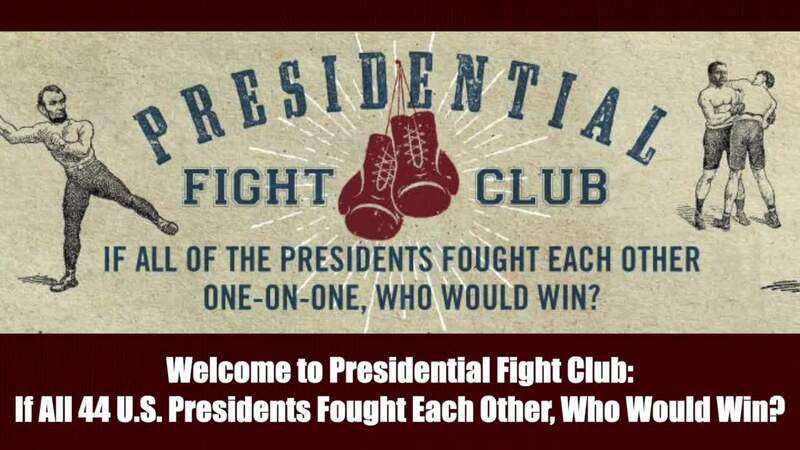 Description: Welcome to Presidential Fight Club: A battle royale among all 44 men who served as the U.S. president. This podcast is hosted by two history professors: Scott Rank and James Early. 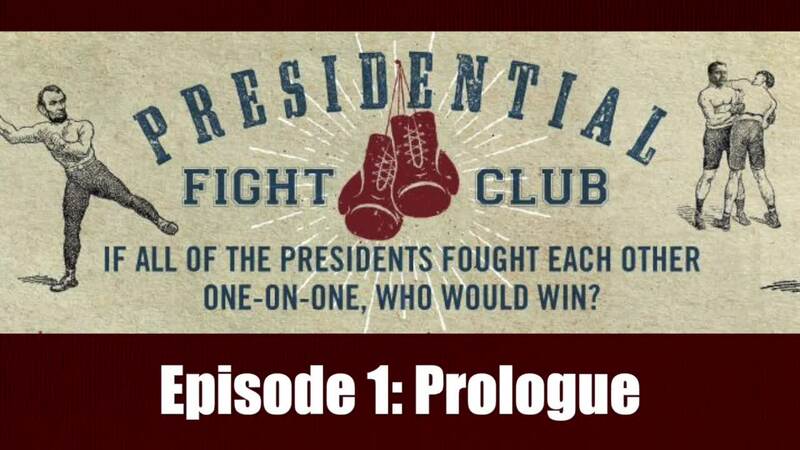 We are going to narrate each of the one-on-one fights between presidents in 44 short podcast episodes. Description: A few announcements about the series before we dive into the fight.